A fruit chewy bite-sized candy with a colorful candy shell, Skittles candies have been enjoyed by fans for decades. Today, over 200 million Skittles candies are produced on a daily basis. 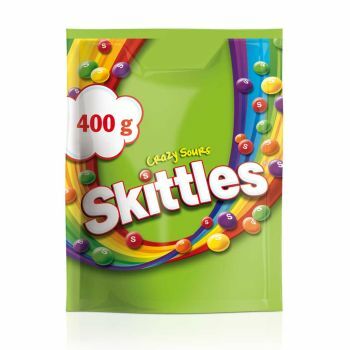 400g of Skittles Sours flavored candies in a handy pouch. Share the Rainbow, Taste the Rainbow. Exclusively available in travel retail. Save precious time at the store by reserving this product now. It'll be ready and waiting for you to collect in store before your trip. No payment is required until collection. The converter is only offered for convenience. At the time of purchase, the exchange rate will be calculated according to the local quotation. Copyright © 2013-2019 Dufry. All rights reserved.